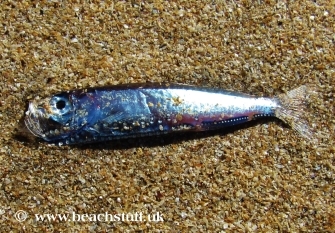 At times, dead fish are washed up on the strandline. 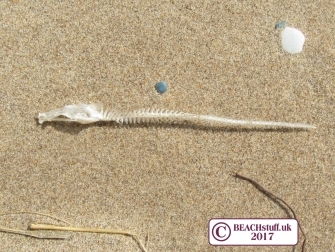 These fish will generally be dead before they are washed up rather than being washed up and then suffocating in the air (in the way that jellyfish do, for example) as fish, unless injured, are generally strong swimmers. 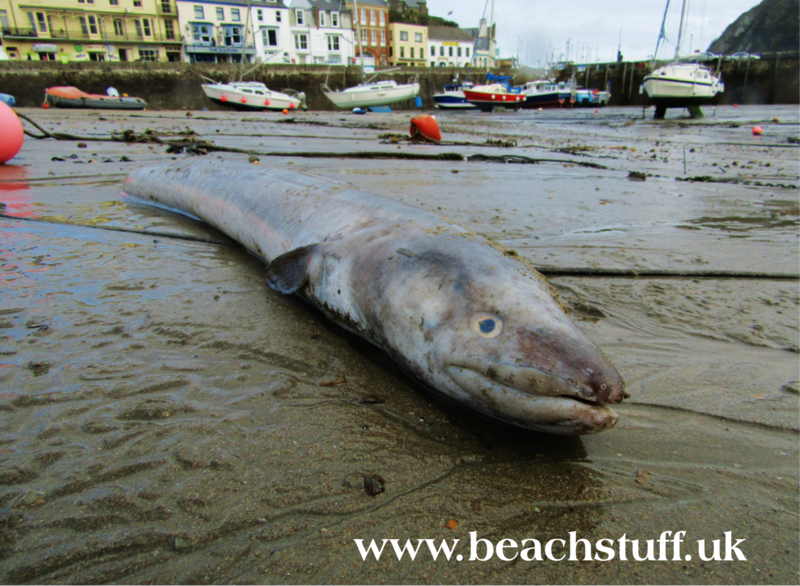 There have been some instances of large numbers of single species being washed up at once. 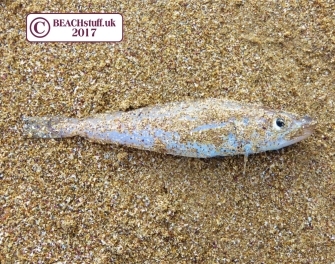 For example, in December 2016, it was reported that thousands of dead sardines had washed up on a beach in West Cornwall, possible due to fishing practices in the vicinity (news report here: itv.com.) However, these spectacular 'gull feasts' are unusual. 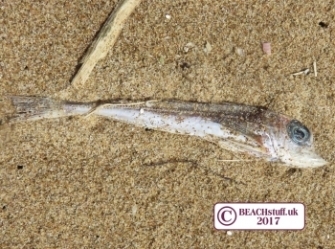 The distinctive facial profile of this little fish makes it look like it may be a small gurnard - a fish that feeds on the ocean floor. This sand eel is found commonly in our rock pools. It is not an eel at all but a long slender, silver fish - a couple of inches long. Sand eels are the preferred food of puffins. For an actual eel, scoot further down the page to this. 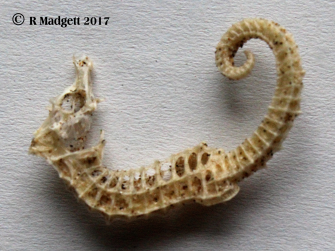 More on this amazing seahorse find here. The dog fish is a small member of the shark family, a catshark in fact.It has brown spots and feeds on the sea floor - eating whatever it can catch - sea snail, marine worms, fish. 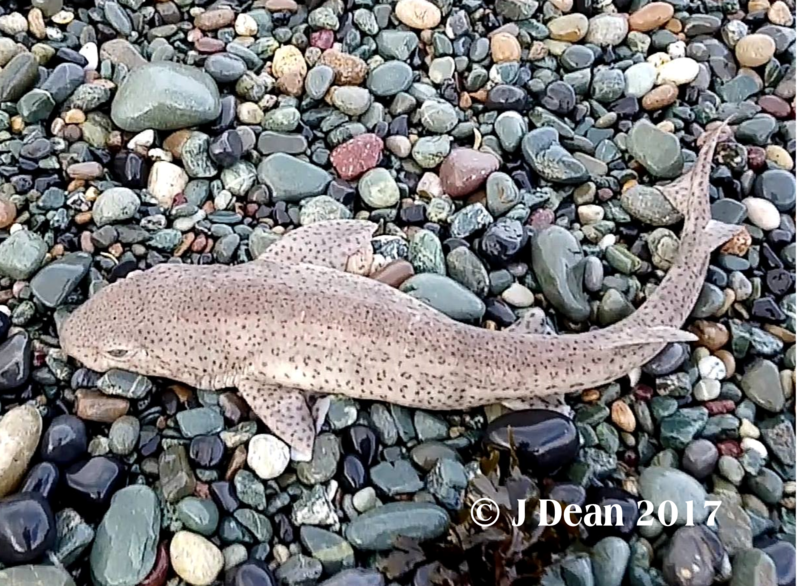 The eggs of the dogfish can be seen here. Sometimes called a Greater Dogfish or Bull Huss, this is another member of the shark family that is common in British waters. 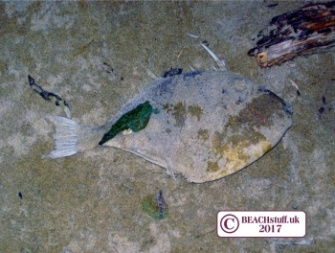 The one pictured was found by James stranded on the beach. 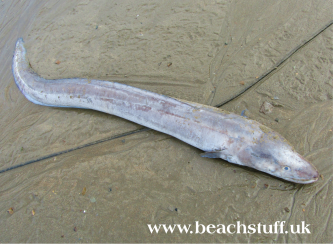 It was about two foot long and still alive. 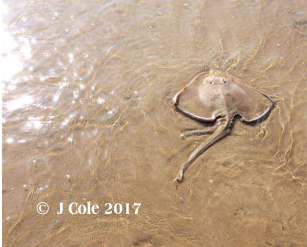 James got it into a tidal pool to give it a chance of survival. 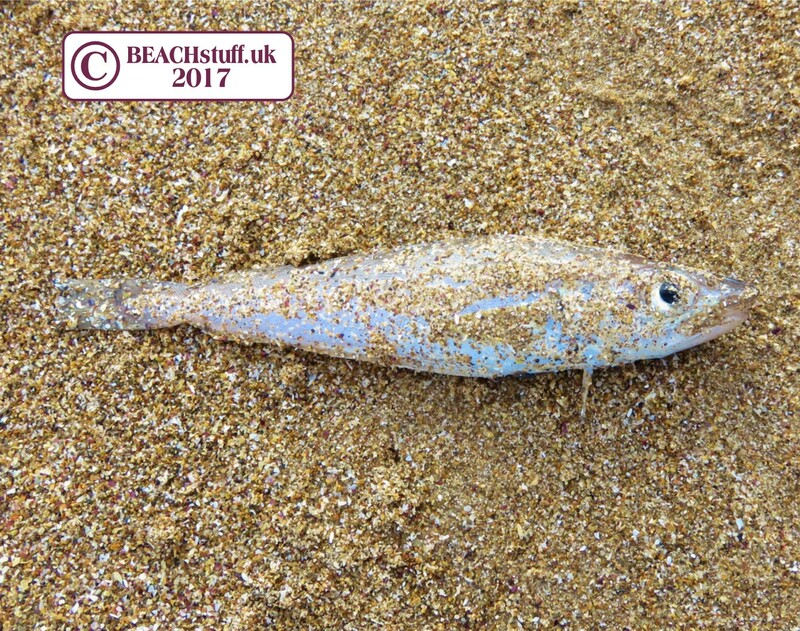 This little pearlside fish lives in deep water and is rarely found in our shallow seasides except when it is washed up on the beach. On its underside, you can see lines of tiny lumps. It is thought that in the dark waters where is lives, these lines produce light maybe to confuse predators beneath it. 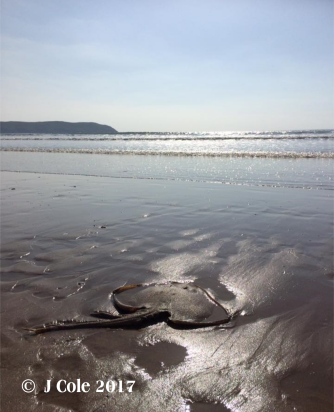 The ray on the left was stranded on Woolacombe Beach. 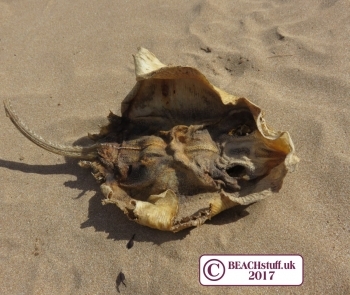 It had dried in the sun which shriveled it to this hard, leathery crumple. Two years later, on the same beach, Julie spotted the ray below. Thanks for the photos Julie. It looks like it is a small-eyed ray, a fish whose numbers are under threat because of the loss of its habitat but it is not uncommon in the Bristol Channel. Right: A spotted ray found in Ilfracombe Harbour, North Devon. 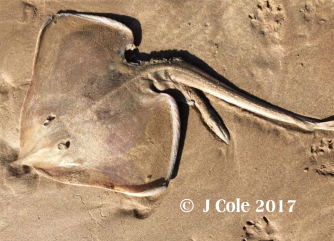 The tail of a ray, found by David on Caister Beach. 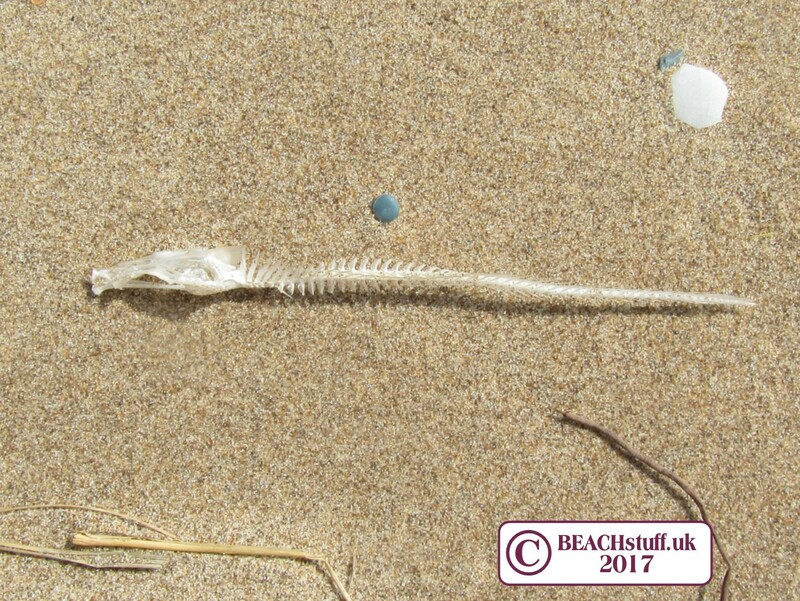 He described the tail as: "about 8 inches long, hard bony texture and surrounded with razor sharp teeth"
These are my absolute favourite species of fish to find. Why? If you see one just take a look at its teeth. They look like the sort of typica fish shape anyone mught draw, but their teeth are almost like human teeth - in a very fishy mouth. The teeth are not, of course, only there for my amusement but are used to crack open sea urchins and sea snail shells. 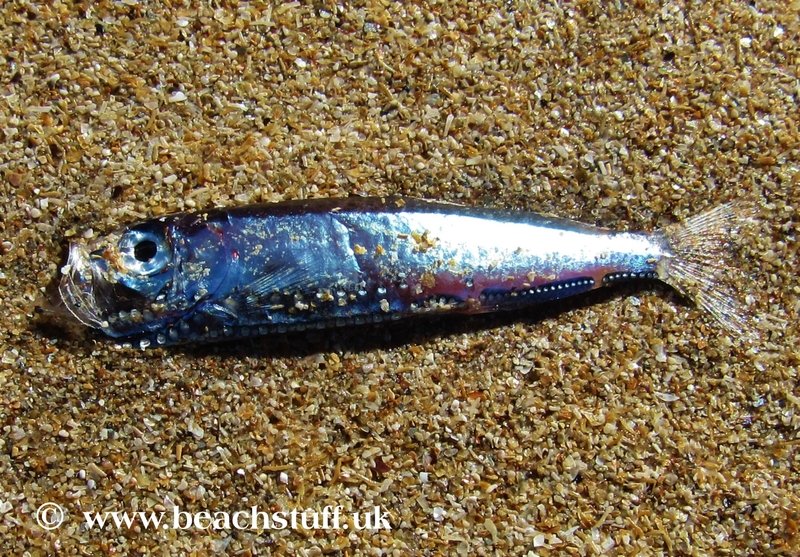 A juvenile herring fish, distinguishable by the blue on its back which is less pronounced in older herrings. Herrings often swim in large shoals in the shallows near the coast. 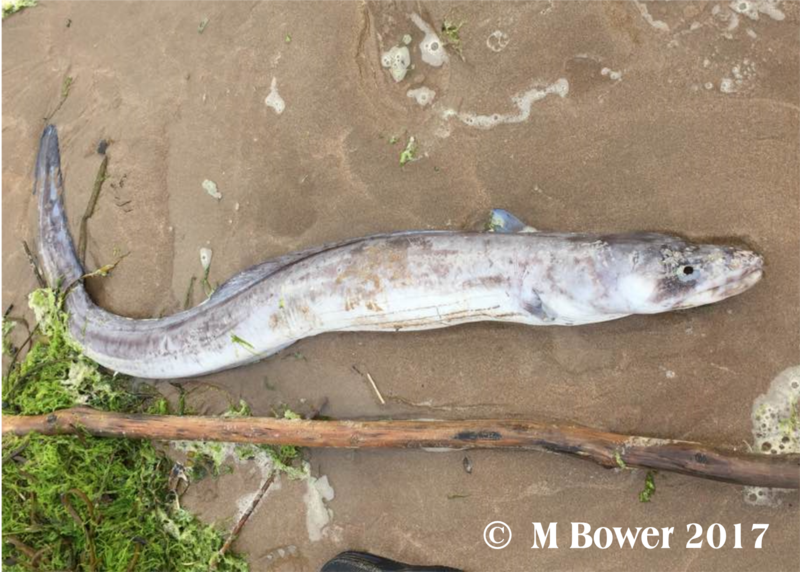 Each fish can grow to be 45cm long. Unlike moray eels and electric eels, conger eels are commonly found in UK waters. 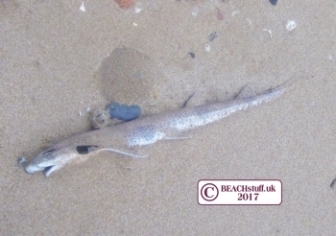 This one was found washed up in North Devon in 2017 by Melissa and measured nearly a metre long. More details on it here. 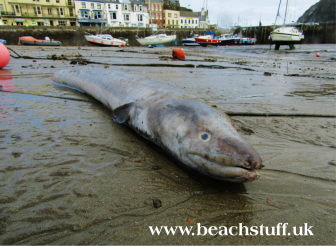 Below: a conger eeel found in Ilfracombe Harbour in 2019. 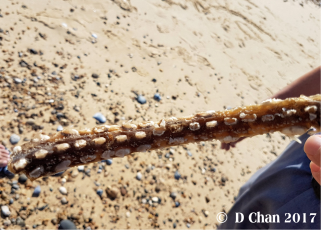 It was about 1-5 to 2 metres long. 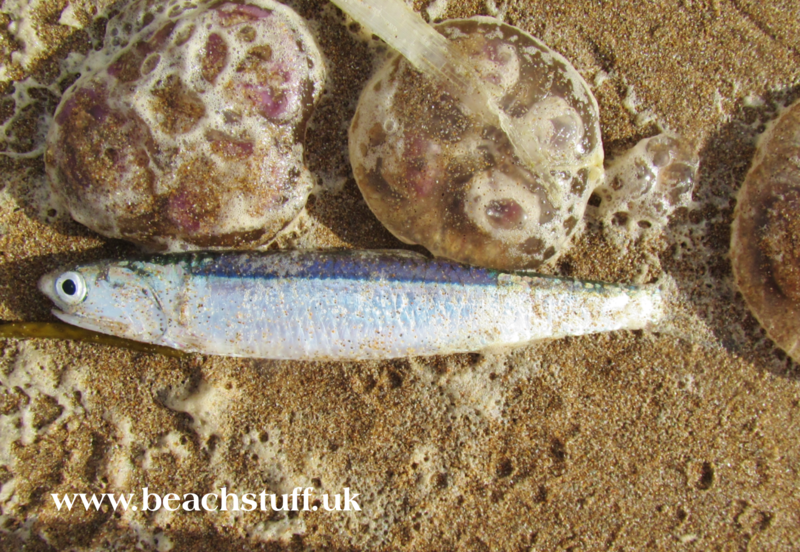 Have you got more fish pictures? Have a go at our ID challenge! 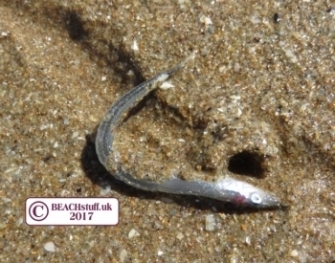 Any idea what this fish is?Just a few inches long. 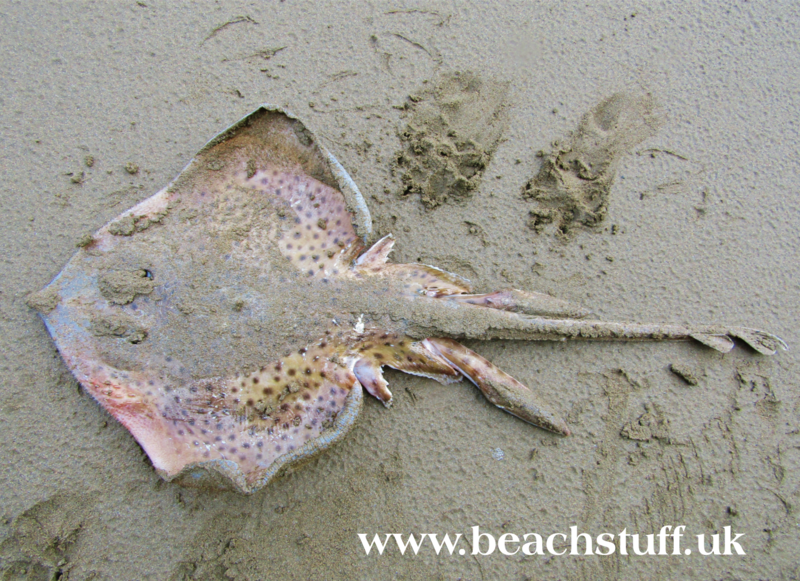 And yes, I should have cleaned the sand off it which doesn't make the ID challenge any easier. 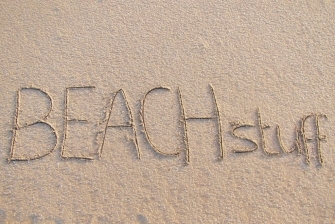 Send your ideas to hello@beachstuff.uk and the best will be featured on this page.